There you were, cruising to the beach for a day in the sun and all of a sudden, a stinky, electric-smelling smoke screen is coming from under your hood. After everything cooled down, you determined that you were going to need a $200 alternator for an $800 car. After kicking the tires a few times and discussing the situation with the cops that stopped to help, you’ve decided a Florida car parts junkyard might be your best alternative. Not only will the installation of that alternator extend the life of your vehicle, it will also extend the life of the part. The used alternator you will purchase was removed or will be removed from a car that’s no longer functional. Every part from that donor car that can be used is a benefit to all mankind. Even recycling uses energy, so each and every part that can be used saves energy, and therefore, the Earth. Nowadays, money is tight for nearly everyone. Not having a bunch of money is the reason you bought a used car in the first place. The cost of a new alternator would have been a large percentage of what you initially paid for the car. A perfectly functional part such as an alternator acquired from a Florida junkyard nearby, can help keep the cost of repairs manageable, saving your money for more important things in life, such as rent, groceries, and utility bills. Every mechanic that has ever turned a wrench has faced the prospect of having the wrong part on-hand. 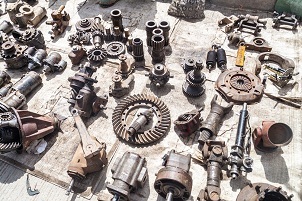 Junk yards in Florida have clean, usable parts that in nearly every instance were original to the vehicle from which they were pulled. Newer and better cars are put on the market every year, and older parts are harder and harder to locate. Many companies specialize in aftermarket, non-original equipment parts that may or may not fit and function exactly like the original was designed to function.